Gandhi was seen helping her get down and even shook hands with her after she got off the van. 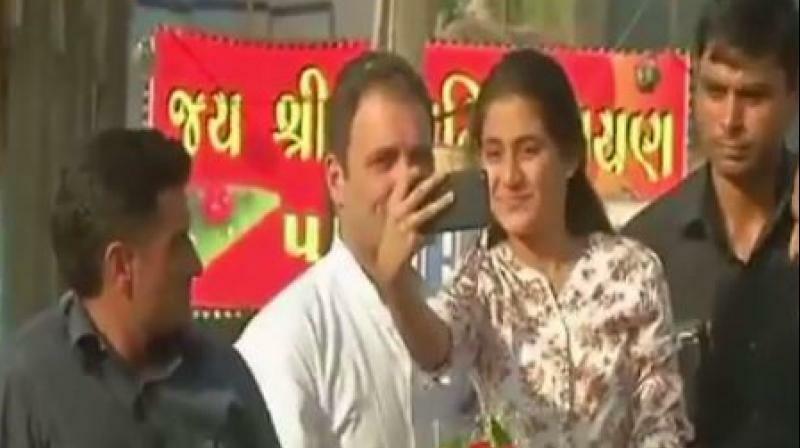 Bharuch: A girl got aboard the van of Congress vice-president Rahul Gandhi and clicked selfies with him during his road show in Bharuch in south Gujarat on Wednesday. A video of the incident showed the girl climbing Gandhi’s van when it reached Kasak Circle area, getting close to him and clicking selfies as SPG personnel looked on. Gandhi was seen helping her get down and even shook hands with her after she got off the van. The girl, identified as Mantsha Ibrahim Sheth, a class 10 student, said Gandhi obliged after she requested him for a selfie. “I was following him for quite a long time during the road show. He gave me flowers and I asked him can I take selfie with him, to which he agreed,” she told reporters. Gandhi began his three-day campaign tour of south Gujarat in the run up to the next month’s Assembly elections.